Having surveyed the recapitulation and progression views of the seven churches, seven seals, seven trumpets and the seven plagues, it is obvious that many details in the book of Revelation have been left out. In a word, both views are far from all-inclusive. Such things as the scenario of chapters 12, 13, 14 and 17 as well as that of chapters 18 to 22 are completely ignored. One method that is now in vogue is called the “chiastic view” of the book of Revelation. 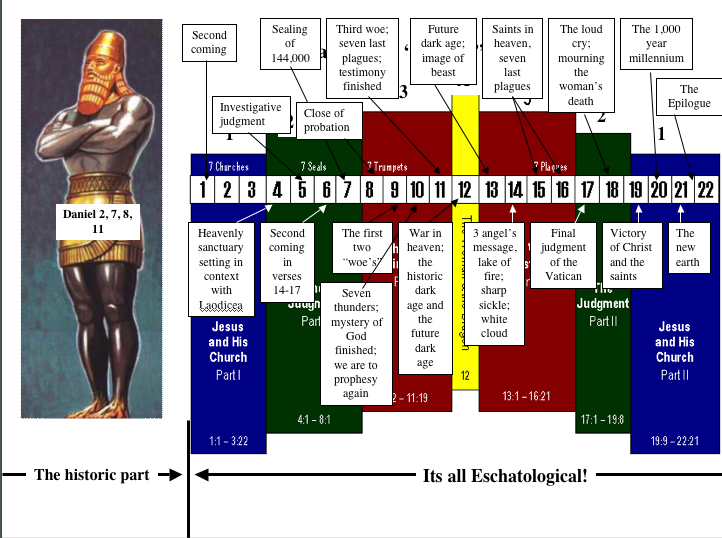 Some believe that the chiastic structure of the Apocalypse . . . strongly points to recapitulation. In other words, this view is a modification of the recapitulation view conceived, we assume, to be inclusive of the whole book of Revelation instead of only one part. 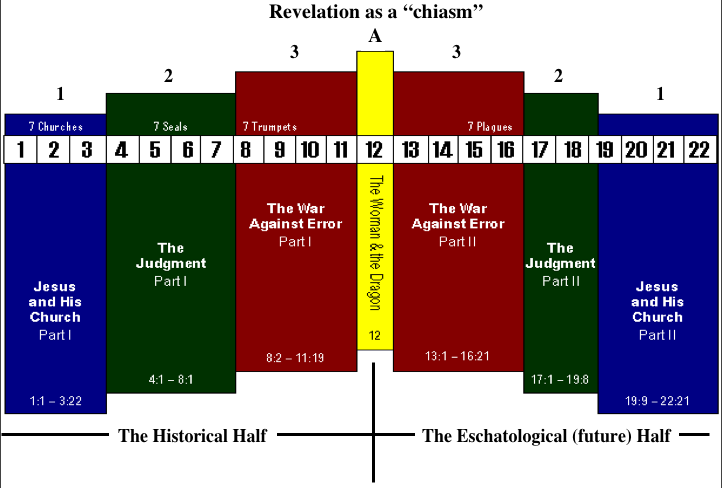 As can be seen, the subjects of Revelation are arranged in the basic form of a cross which is the meaning of the Greek word “chiasma.” Note that the blue items on the extreme ends of the cross are considered mirror images of each other and likewise for the inner green and red items. The yellow center section is seen as the center focus of the whole book, namely the Great Controversy between Christ or the church and Satan. Therefore, the blue part inclusive of Rev.1:1-3:22 is parallel to Rev.19:9-22:21. The green part of Rev.4:1-8:1 is parallel to Rev.17:1-19:8. The red part of Rev.8:2-11:19 is parallel to Rev.13:1-18:21. The yellow part is found in Rev.12 which is the center or midpoint focus of the whole book of Revelation. While there is no settled opinion regarding the exact placements of the texts, the basic ideas is that the first half of Revelation from Rev.1:1 to 11:19 is historic, while the last half, from Rev.12:1 to 22:21, is basically future. 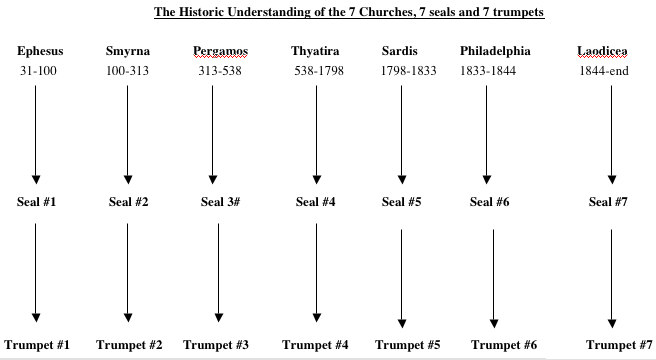 Now, compare this “chiastic, recapitulation” view with the “recapitulation” view of the churches, seals and trumpets as proposed by the Commentary and Uriah Smith. So, as I see it, this view leans more to “progression” rather than the recapitulation view favored by the Commentary and Uriah Smith. But, because it has become so popular in our church, it implies that there is a basic dissatisfaction with the earlier view. But, there are problems with this chiastic view which come to light when we take the contents of all 22 chapters of Revelation into consideration. 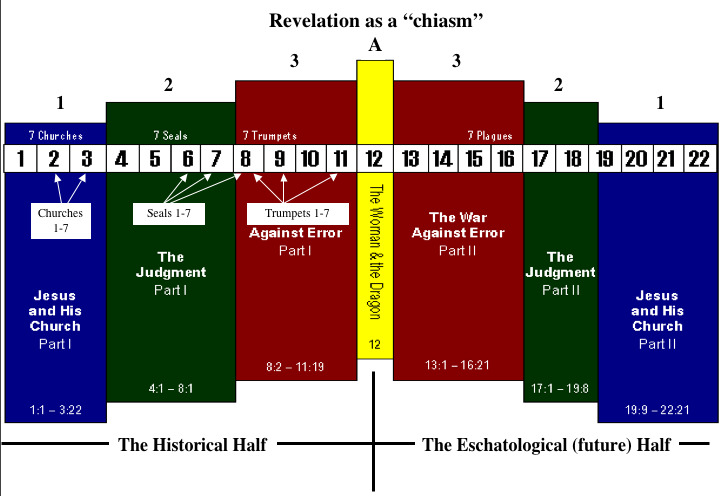 Note especially that Revelation 1:7 and 6:14-21 as well as 8:5 depict the second coming and the close of probation depicted in the “historic” half of the chasm even though close study reveals practically all are future, not historic! But, added to those three outstanding examples, there are other difficulties in the chiastic view that make it even more difficult, if not impossible to divide the book of Revelation into a historic and an eschatological framework. 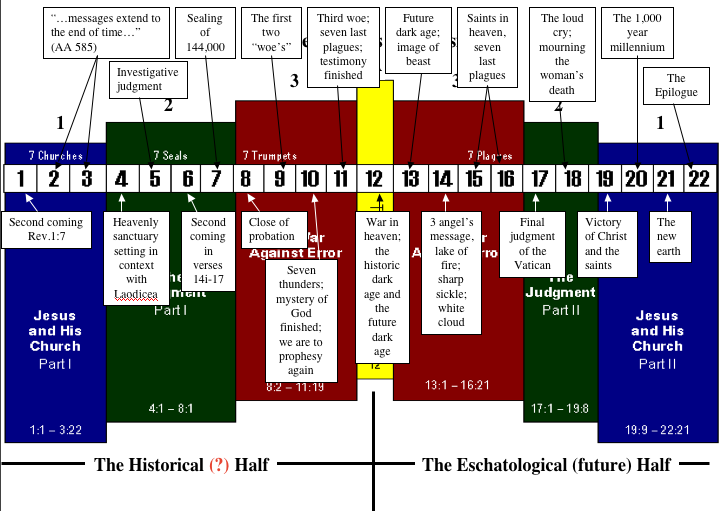 Note that all the chapters in the “Historic Half” are just as eschatological as the last half! This shows the important relationship of the book of Daniel to the book of Revelation. Without the book of Daniel, the book of Revelation is incomplete. Instead of looking for some kind of short cut to a clear understanding, we need to take each chapter as they come and analyze them in the context of their associated chapters as we have done in the preceding presentation.